Today, the Pennsylvania State Quarter Coin remembers when the adventurers arrived in Philadelphia after a 1000-mile journey from Lake Erie in their roughly made boat 222 years ago. The two men built their boat at Presque Isle in northwest Pennsylvania. They left in September and arrived at Philadelphia on November 10, 1795. Voyage from Lake Erie to Philadelphia. Journal of the voyage of the schooner White Fish in the year 1795, from Lake Erie to Philadelphia. I have extracted from my journal of 1795, the following account of my voyage from Presque Isle, on Lake Erie, to Philadelphia, accompanied by Mr. David Lummis, in the schooner White Fish, constructed by ourselves at the former place in the summer of that year, without adequate tools for such a work, and the whole of the timber taken from the woods. The dimensions of the vessel were, 18 feet keel, 23 feet from stem to stern, and 6 feet beam, without a deck. On the 22d of September, 1795, at 1 o’clock, P. M. we commenced our voyage with a fair wind, and arrived on the 23d, at 9 o’clock, P. M. in the harbor of Buffalo creek, at the eastern extremity of Lake Erie, distant from our departure about 90 miles, without any remarkable occurrence, except in passing the bar, which, as it was dark, and the surf beating high, was difficult and dangerous, but when we had entered, found it an excellent harbor. 25th. Having been detained yesterday by stress of weather, but it having changed, and appearing fine and pleasant this morning, we put out of the harbor, and passing Fort Erie, entered the strait or river Niagara, and rowed down to Chippawa river, distant 20 miles, where we arrived about 12 o’clock, M. and landed in the province of Upper Canada. Chippawa empties itself into the Niagara river, two miles and a half above the falls, and just within its mouth there is a wharf, and a large store house, to deposit the goods carried round the falls. The British have a garrison at this place, at present commanded by captain Hamilton, by whom we were treated with much politeness. Having leisure this afternoon we crossed the river Niagara to Fort Schlosser, and went down to the falls, on the United States’ side, for the double purpose of having a view from both sides of the river, and also of ascertaining the perpendicular height, which I found, by a fair experiment, made entirely to my satisfaction, to be one hundred and sixty-two feet. As many experiments have been made, and different accounts given of the perpendicular height of this stupendous cascade, I have been the more particular, and feel no doubt in asserting, that this admeasurement is accurate. In traversing down the river from Fort Schlosser, the mind of the observer is gradually filled with a degree of horror, occasioned by the astonishing and tremendous noise of the water, as it descends over an uneven bed of rocks, and is hurried on to the perpendicular pitch; but on arriving at that place, the feelings are instantaneously changed, and astonishment succeeds the place of horror. The stupendous abyss—the beautiful and varied shades of the water in descending—the considerable spray that is continually arising, and the tremendous noise, the cause of which occasions a sensible tremor in the earth; all presented to the view and hearing at the same time, conspire to fill the mind with astonishment. The river, immediately above the perpendicular pitch, is divided by an island, called Goat Island, the largest portion of the water falls on the Canada side, and forms a kind of semi-circle, or, as it has been sometimes denominated, the horseshoe. The extent of the cascade, including Goat Island, from the best observations I was enabled to make, having no instrument with me to take angles, is about three quarters of a mile—but the river, immediately below the cascade, gliding off rectangularly, is not more than a quarter of a mile wide, and does not much exceed that width until it approaches near to Queenstown. The spray is so considerable that whilst I remained there, which was but a short time, no longer than sufficient to complete the operation, I was almost wet to the skin. And at the same time, one of the most beautiful and luxuriant colored rainbows was reflected, by the sun, on the spray, I ever beheld, forming almost an entire circle, the sight of which was a sufficient compensation for being wet. It has been frequently said that there is a possibility of passing, with safety, between the sheet of water and the rocks, clear across the river; but, from observation, I conceive it to be fabulous, and the thing utterly impossible. You may, ’tis true, penetrate some distance between the sheet of water and the rocks, on the Canada side, under what is called the table rock, but to no great extent. The table rock projecting considerably, forms a vacuum between it and the sheet of water; but, on the United States side, the sheet of water falls so close to the rock, that there is very little if any vacuum whatever. The scraggy appearance of the perpendicular rocks, on each side of the great chasm below the falls, as far as I had an opportunity of viewing, confirms me in the belief that this great chasm has been excavated by the action of the river from time immemorial, and that the perpendicular pitch was not formerly as high up as it is now by several miles; and, I have no doubt that, in process of time, it will wear away clear up to Lake Eric. Having fully satisfied ourselves with the view of the falls, we returned to Chippawa. 26th. Having a wagon in preparation, we had our boat loaded thereon, early this morning, and proceeded to the lower landing at Queenstown, about ten miles. And launching her, put our baggage on board, and proceeded down the river to Newark, at the confluence of Niagara river with Lake Ontario, opposite Fort Niagara, a distance of seven miles, where we arrived about dark, and where we remained until the 29th. And thence proceeded on our voyage, coasting the southern shore of Lake Ontario, which is by far superior to Lake Erie for navigation, and arrived, on the 2d of October, at the great Sodus, a most beautiful, capacious, and safe Bay for vessels, both on account of water as well as weather, and is situated about 100 miles eastward of Newark, and 30 miles west of Oswego. At this place, we purchased a Massasauga Indian Canoe, made of birch bark, very handsomely finished, and so light, that Mr. Lummis and I, carried her, with ease, on our shoulders to our schooner, a considerable distance, notwithstanding she was of sufficient capacity to carry ten barrels of flour. It was our intention to have brought her to Philadelphia, and place her in Peale’s Museum, but in this we were unfortunately disappointed by an accident which we could not possibly have foreseen. Oct. 3d. The wind answering, we set sail at 10 o’clock A. M. and on our passage from Sodus to Oswego, in encountering a tolerably severe gale, the rope, which fastened the canoe to the schooner, gave way, and she went off before the wind, directly from the shore. We immediately put about, and regained the canoe, and secured her as well as our means would permit, but it was insufficient. The same thing occurred twice more, when I found, as we were getting a great distance from the land, and the wind increasing, that it would be necessary to abandon the canoe altogether, if she again broke loose, or run the risk, and very great it was, of being lost ourselves. She broke loose again, and was abandoned, and we, with the greatest possible exertion, regained the shore, the wind continuing to increase. We arrived, however, at Oswego, at 11 o’clock A. M. without any further accident, keeping close in shore, and the wind continuing off the land. From the 4th to the 14th inclusive, we were ascending the Oswego river, 12 miles to the falls, getting the schooner carried round the falls, 1 mile, ascending , thence, 12 miles to the three river point, or more properly, to the confluence of the Annandauga and Oneida rivers, ascending the Oneida river, 18 miles, sailing through the Oneida Lake, 36 miles, and ascending Wood Creek, 30 miles, to the portage, of 1 mile, between it and the Mohawk river. Having been obliged to exert every nerve, in many places, where the water was rapid, the labor being excessive, with a vessel having a keel. 15th. Had the schooner loaded the third time on a wagon and carried across the portage, to the Mohawk river, passing the site of the fort, formerly called Fort Stanwix, where Col. St. Leger besieged Col. Gansevoort, during the revolutionary war, in the year 1777, which was so nobly defended, and the siege raised. 16th. We got under way early, and descended the river with tolerable expedition and some comfort, the day being pleasant, and arrived at the Little Falls of the Mohawk about 2 o’clock, P. M. and had the good fortune to have the schooner carried over the portage of 1 mile, in time to be prepared to recommence our voyage in the morning. 18th. Without anything remarkable, we arrived at the city of Schenectady. 19th. Had the schooner loaded on a wagon for the last time, and proceeded to the city of Albany, where we arrived late in the evening. 23d. Left Albany, and proceeded on our voyage down the Hudson river, and arrived at the city of New York on the 26th, having had a pleasant passage down the river. We remained at New York until the 30th, and thence proceeded on our voyage, through the narrows, by Sandy Hook, and along the Jersey coast, and doubled Cape May on the 4th of November, the weather, fortunately, having been very pleasant during our passage along the coast. And on the 10th, having sailed up the bay and river Delaware, completing a voyage of nearly 1000 miles, in an open boat, arrived and anchored off Market or High street, at 12 o’clock, M. and fired a federal salute from a blunderbuss. Afterwards the schooner was conveyed to the State House Yard, and remained there until she went to pieces. I am, very respectfully, your friend John Thomson. Mr. Lummis was lost in a storm, on his passage from Philadelphia to Charleston, S.C. in 1804.—Penn. Gaz. 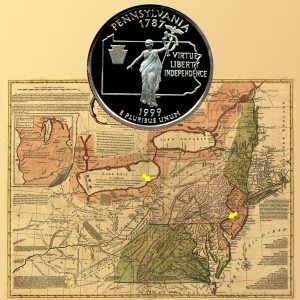 The Pennsylvania State Quarter Coin shows with a map, circa late 1700s, of the area traversed by the men in the schooner White Fish.